Flower essences have been gaining popularity recently in holistic veterinary health care as an alternative, natural remedy mainly to support and maintain the mental health of pets. Many dog parents have reported good results upon using flower essences on their dogs. In particular, flower essences seem to be effective in helping pets with emotional issues that may lead to behavioral problems. Do Flower Essences Work on Dogs? How do I Administer Flower Essences to My Dog? Where Can I Get Flower Essences? Flower essences are "extracts" made from flowers and plants and are considered as a type of alternative remedy for both animals (e.g. dogs, cats, horses, rabbits, etc.) and humans. They mainly work on an energetic level and have positive effects on our mental and emotional levels. Flower essences use parts of different kinds of flowers, plants, trees, and bushes to make extracts which are then diluted and potentized to become effective. It sounds a bit like homeopathy, you may think. Yes, but homeopathic remedies use more than flowers and plants as their ingredients. Also homeopathic remedies are more for treating physical ailments whereas flower essences mainly take care of the mental and emotional parts. The first flower essences were developed by Dr. Edward Bach (1886-1936). He identified a total of 38 healing plants that he believed could be used to remedy all negative states of mind that afflict people and animals. To this day, 38 Bach flower essences are available, each for tackling a specific range of emotional and behavioral problems. Over the years, other types of flower essences have been developed by other people and companies in various countries. There are now also special blends of flower essences for dogs specifically concocted to treat common dog emotional and behavioral problems. Flower essences have been growing in popularity in the field of animal health and are being widely used by holistic veterinarians, pet training centers etc. They use flower essences to help treat such emotional problems as stress, separation anxiety, hyperactivity, etc. that are commonly found in pets. Flower essences gently restore the balance between mind and body by getting rid of negative emotions (such as, fear, worry, anxiety) which interfere with the equilibrium of the being as a whole. As the mind is balanced and relaxed, the body usually becomes stronger and has greater ability to heal itself. Flower essences are made from various flowers and plants naturally and organically grown, and not contaminated with pesticides and other chemicals. There are two ways to prepare the remedies. One way is called the "sun method". In this method, the flowers to be used are put in a clean, glass bowl full of spring water and are left floating in the water under direct morning sunlight for 3-4 hours. The flowers are then removed and the resulting water is stored in dark bottles half filled with alcohol such as brandy for preservation. This preparation is called "mother essence or tincture". To prepare a remedy, spring water is used to dilute drops of the mother essence. Another way of preparing the essences is called the "boiling method". The flowers are boiled in spring water before being treated in the same way as the sun method. You may wonder how several drops of "flower water" can help your dog. As mysterious as it sounds, dogs generally do respond positively to flower essences, and it has been shown and proven that flower essences are successful in treating a wide range of emotional, sometimes physical, imbalances. Dogs have emotions just like we do and there are times when dogs have negative emotions. Flower essences are very useful in helping dogs overcome these negative feelings. 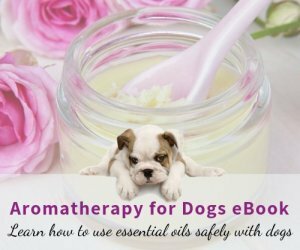 For example, flower essences can bring relief and healing to your dogs when they are depressed, nervous, anxious, lonely, grieving (for a lost companion), etc. 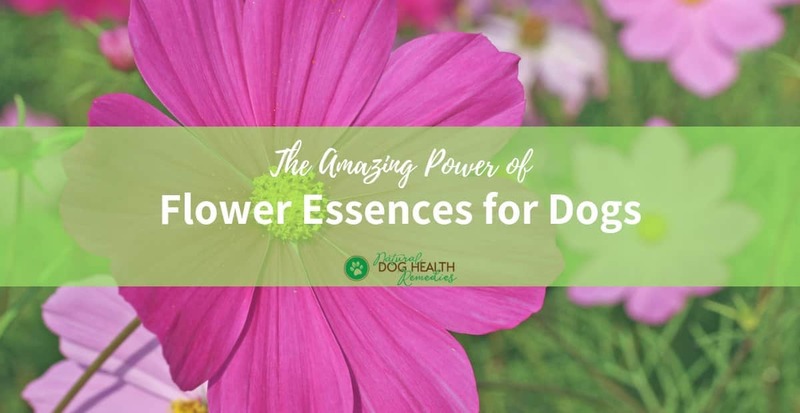 In other words, flower essences help fine-tune our dogs mentally and emotionally, allowing them to experience a higher standard of health and well-being not only physically but also on a higher emotional level. Essences can also be used to adjust different temperaments, such as aggression, hyperactivity, over-dominance, etc. As well, flower essences for dogs can help owners get rid of bad dog behaviors such as excessive barking, chewing, hole digging, etc. Flower essences for dogs can also be used, in conjunction with other medications, to aid treatment of some physical ailments, such as seizures, skin problems, dog arthritis, etc. Perhaps the best known remedy is Bach's "Rescue Remedy", which is a combination of five original essences for synergistic effects and is used for emergencies and first aid situations, stress, trauma, etc. 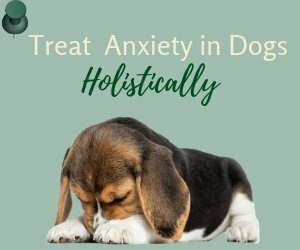 Rescue Remedy can be given to a dog by simply adding about 4 drops of the remedy to the drinking water during any time of stress. Flower essences have no side-effects, and even if a wrong essence has been chosen, it will do no harm to the dog. Flower essences for dogs can also be used in conjunction with other healing modalities, conventional or holistic, to promote your dog's overall well being. Administering essences to your dog can be done in several ways. You can simply drip the essence directly into the dog's mouth or put it on his nose to lick off. Make sure, however, that the dropper does not touch his skin or mouth. Otherwise, the bottle of essence will be contaminated. Alternatively, put a few drops of the essence in the drinking water of your dog. Another way is to rub the essence on some exposed (unbroken and non-irritated) skin (for example, inner ear flap, pads, belly). Finally, you can also put a few drops of the essence in a spritzer, mix it with a little distilled water, and spray the remedy in the vicinity of the dog. 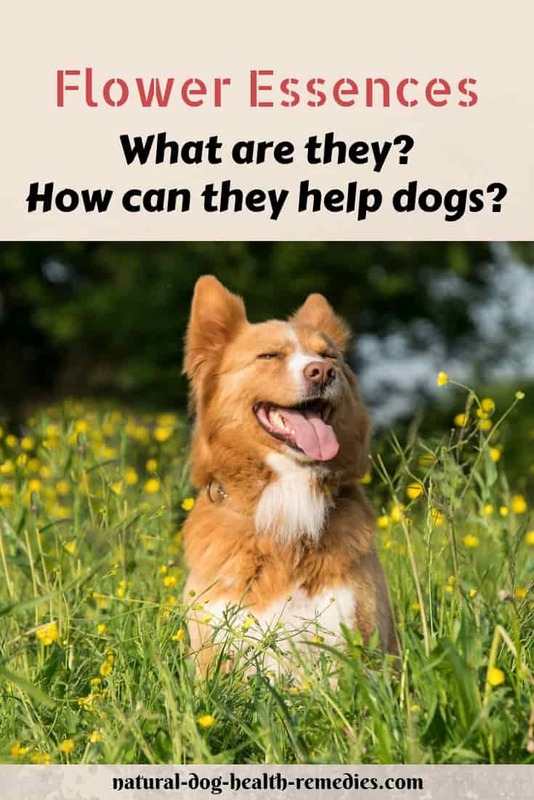 The discussion goes beyond the disease name, to the actual signs and symptoms experienced by the dog, as well as the possible causative and aggravating factors, and so on. This whole process of understanding the individual dog who is ill can take quite a while (especially in chronic ailments). Flower essences usually work pretty quickly. Generally speaking, when an appropriate essence is used, your dog should start feeling better in a few days. However, having said that, how well and how quickly a dog responds to essences is unique to each individual doggie. Many dogs respond quickly and only require the remedy for a short period. 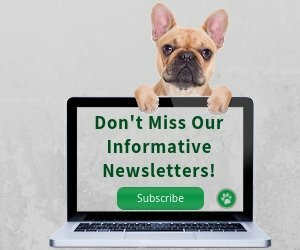 Other dogs may require a longer period to see significant emotional or behavioral changes. If you give a flower essence remedy to your dog, therefore, it is a very good idea to monitor his response to the essence in order to gauge how effectively and quickly the remedy works so that follow-up action can be taken accordingly. Flower essences should not replace vital or important medical diagnosis and attention - Acute or serious health problems need to be attended to immediately and should be taken to a vet for medical treatment. Just because your dog is using essences does not mean that you can abandon other practices or approaches. For example, an aggressive dog should still be trained and monitored even when or after he is being treated with flower essence. Remember also that, very often, emotional imbalances (such as depression or aggression) can be due to an underlying physical problem. Before using an essence to treat the secondary symptom (the emotional problem), therefore, always make sure that your dog does not have a physical illness which may be the root cause. Where Can I Get Flower Essences for Dogs? You can buy essences from health food stores, and pet stores with a holistic focus also carry a variety of blends of flower essences for dogs. These blends are specifically made for pets with problems, such as separation anxiety, depression, etc. Visit this page for our recommendation of some effective blends of flower essences for dogs!